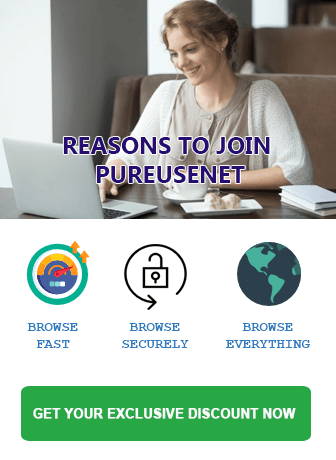 PureUsenet is a European provider that offers a wide range of plans based on your desired connection speed. 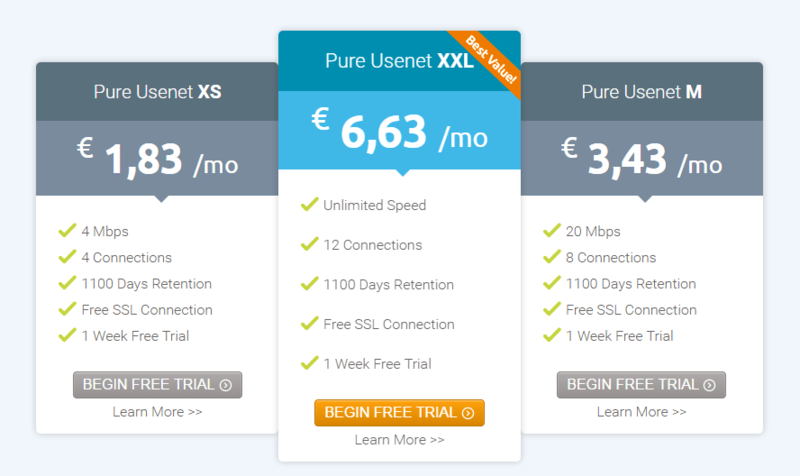 Pure Usenet provides download speed caps ranging from 4 Mbps for €2,29 a month up to 60 Mbps for €6,29 a month. Those wanting the very best performance can go for the XXL unlimited speed plan for €8,29 a month. Try the service for 7 days free. Unlike some other European Usenet services Pure Usenet doesn’t require you to connect from an IP address in a specific location to sign up. That means regardless of where you are located they are open to users around the world. You’ll offer a wide range of payment options including bitcoin. Here is a look at PureUsenet’s packages. They have speed capped plans ranging from 4 Mbps up to 60 Mbps. They also have an unlimited package for those who do not want their speed capped. Regardless of the plan chosen all members have access to over 1,100 days of binary retention across 120,000+ newsgroups. PureUsenet offers 1 month, 3 months, 6 months, and 1 year terms. Their pricing is very reasonable. Visit the Pure Usenet special page to sign up and save. Signing up for a year of Usenet will save you 20% off. Pure Usenet offers multiple payment options. They accept Visa, MasterCard, iDEAL, and Paysafecard. For privacy conscious users they also supports bitcoin payments. Pure Usenet understands that new users need time to test their service. So they offer a one week free trial. You can sign up for any plan and receive a 7 day free trial period for that package. When the trial ends you can sign up for any PureUsenet package. You can also change packages if you decide you want a faster or slower plan in the future. You can access over 1,100 days of binary retention. Across 120,000+ newsgroups. using PureUsenet. That means you can download binaries that are over 3 years old. I think you will be happy PureUsenet their retention. PureUsenet offers a range of packages to meet your Usenet Newsgroup access needs.Pure Usenet includes between 4 and 12 connections with their plans. The number of connections is based on which speed tier you choose. You will want to use the number of connections it takes to either max your Internet connection. Or the number of connections it you would like to dedicate to newsgroup downloads. Using more connections than necessary just puts additional, unnecessary overhead on your system. For example Pure Usenet can more than max out a 60 Mbit line with 12 connections. The number of connections is tied to the plan you select. . They offer unlimited Usenet downloads at speeds ranging from 4 Mbit all the way up to 60 Mbit. With several speed options in between and an XXL plan with unlimited speeds. Tiered plans include 4, 8, 20, 30 and 60 Mbps caps.They have several plans that include speed caps along with an uncapped plan. PureUsenet members can connect to their NNTP servers in Europe. They do not have servers in the United Sates. You can connect to their European servers using the standard NNTP port (119) or SSL port (563). The number of supported connections is based on the plan that you select during sign up. We will not disclose to third parties or sell that information unless you explicitly give us permission to do so or we are legally required. PureUsenet has an FAQ and support page on their site to help you with a few common questions as well as a few technical questions. If you do not find what you’re looking for there you can contact them via email for support. Their customer support will be happy to help resolve any issues. You can contact them by email at support@pureusenet.nl for any technical assistance you may need. The mix of plans and retention Pure Usenet has to offer is terrific. This is why we consider them our Best European Usenet Provider Choice. They are priced very reasonably. You can have access to over 3 years (1,100+ days) of binaries. Sign up for the Pure Usenet free trial and test out their service for yourself. You won't be disappointed!